Traveler of the nineteenth century; died at Vienna about 1873. He was for a time a rich merchant, having made large investments in Siam; but during the war of the English in that country all his property was seized by the British government, and he became financially ruined. He then traveled through Asia, Africa, and the greater part of Europe, until he finally settled in Vienna, where, receiving financial aid from Adolf Jellinek, he was enabled to devote his time to recording the experiences of his travels. He died suddenly before finishing the work. 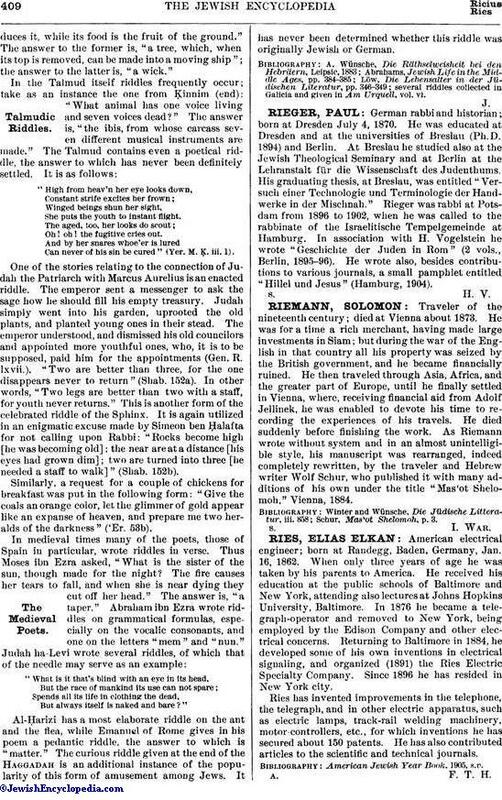 As Riemann wrote without system and in an almost unintelligible style, his manuscript was rearranged, indeed completely rewritten, by the traveler and Hebrew writer Wolf Schur, who published it with many additions of his own under the title "Mas'ot Shelomoh," Vienna, 1884. Schur, Mas'ot Shelomoh, p. 3.